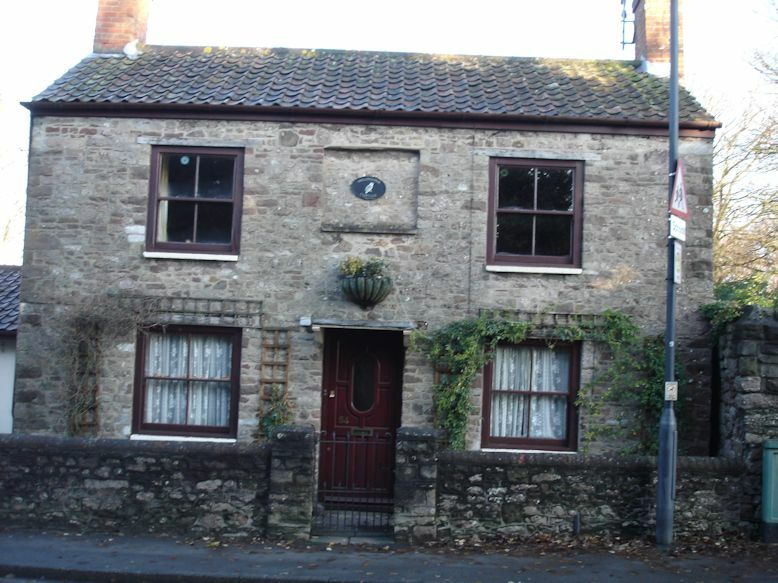 We have not seen the deeds to the house that is now known as Wellbourne at 54 Castle Street in Thornbury. Therefore we can only use what we know about the neighbouring property Threeways Cottage to indicate the early history of this house together with land tax records, censuses etc. We have not found any record of the house being called Wellbourne and can only assume that this is a comparatively recent name. We believe that the house was built by John Powell junior some time around 1830 and certainly before 1839 when the Tithe Map was drawn up. It seems that he built a second house on the property that he inherited and that the new property later became known as Wellbourne. The Tithe Map and the accompanying Tithe Apportionment which were drawn up between 1837 and 1840 show that this second house and its garden were given plot number 23 and that they were owned and occupied by John Powell. John Powell never married but lived a lady who was later described in his will as “Ann Powell, single woman”. We have not yet identified this lady. John Powell died on 18th July 1849. By his will dated 8th September 1847, John Powell left the “messuage or dwellinghouse, garden, well of water and premises” (Wellbourne) that he then occupied to his niece Mary Ann Coleman, the daughter of his sister Paulina. If she died before the age of 21 or without issue the property was to go to Mary Ann’s brother, William Coleman. The two houses adjoining together in the occupation of Mary Olive and William Bevan were to go to Ann Powell a singlewoman who was living with him at that time for her life time. After the death of Ann Powell the other two properties were to be jointly owned by the five children of his sister Paulina three nephews, William, James and John Coleman and his nieces Mary Ann and Louise (the wife of Henry Park) and another nephew Thomas Liddiatt. These properties later became 7 and 9 St John Street in Thornbury. An indenture dated 21 March 1850 says that at the time the will was written (that is, in 1847), Ann was then residing with John, but she had since deceased. We believe that Ann’s death as registered in Thornbury in the September quarter of 1849. Mary Ann and Emma Coleman. The next owner of this property was Mary Ann, the daughter of Paulina Powell who was the sister of the previous owner John Powell junior and the heir to this property under the terms of his will. Paulina had married a grocer Robert Coleman of Bristol. They had a son James baptised on 18th September 1825 and a daughter Mary Ann baptised on 13th January 1828 both at St Michael on the Mount in Bristol. Their son George was born about 1830 and died on March 28th 1833 aged three years. The Bristol Mercury described George as the youngest son of Mr Robert Coleman of Castle Street. We believe that this was 18 Castle Street in Bristol where it appears that Robert was a grocer. The 1830 Pigot’s Directory for Bristol show him listed at that address. The 1841 census shows that Robert was aged 49 and an egg merchant. He and his wife Paulina also aged 49 were living in Castle Street in Bristol. They had two sons; William aged 20 who was a carpenter and James aged 18 who was a grocer. Their daughter Emma was aged 14. Two other daughters Mary Ann and Emma were staying with John and Ann or Nancy Powell in Wellbourne Cottage in the 1841 census. You will note that it appears that the Coleman had two children called Emma in the 1841 census. One of these was living in Castle Street in Bristol with her parents and was aged 14. The other, aged about six was staying with John and Nancy Powell. We cannot explain this. The will of John Powell junior written in 1847 refers to the sons of Paulina as his nephews and says they are William Coleman railway porter of Highbridge, James Coleman, grocer of St Pauls, Bristol and John Coleman beerhouse keeper of St Pauls, Gloucestershire. Paulina died on January 11th 1848 aged 55 years. Although their father Robert Coleman was still alive the census of 1851 shows that his daughters Mary Ann and Emma were living in Wellbourne alone. Despite the fact that Mary Ann was unmarried and only 23 she was now head of the household. Her sister Emma was 18 years old. Mary Ann died aged 24 on February 20th 1852. Her obituary in the Bristol Mercury described her as the second daughter of Mr Robert Coleman, formerly of Castle Street. The census of 1851 shows that her father Robert Coleman was no longer a fruiterer and confirms that he had left Castle Street in Bristol. Robert appears to have ceased to live with any of his family members. In the census of 1851 he was staying in the household of a Chelsea pensioner called Charlie Bunting and by 1861 Robert was in the Bristol City Workhouse in Stapleton, Bristol where he died on 1st July 1876. Robert’s surviving daughter Emma Powell married Henry Fletcher Carter. Henry and Emma Carter. In a Covenant dated 9th April 1888, Mr Henry Carter (a Park Keeper from Gloucester) agreed to pay half the cost of fixing a pump to the well at “Sewell’s Cottage” for joint use by him or his tenants and Mr Henry Hume Lloyd or his tenants. At this time Henry Hume Lloyd owned what later became Threeways, 56 Castle Street which seem to have been called Sewells Cottage. Mr Lloyd agreed to share his right to use the water with Henry Carter the owner of what is now Wellbourne Cottage in exchange for half the cost of renovating it. The Henry Fletcher Carter referred to in this document was the son of Joseph Fletcher Carter and his wife Elizabeth. Henry was baptised 14th September 1828. The 1851 census shows him living at what became 50 Castle Street with his widowed mother Elizabeth a laundress and her other three children. Henry was a shoemaker at that time. On 12th May 1851 Henry had married Emma Powell Coleman and we believe that this is how he came to own Wellbourne Cottage. We understand from a family tree on the internet that Emma had already had one daughter Rose Coleman born about 1849. Emma and her sister were living near to Henry Carter’s family in the 1851 census. Emma was the daughter of Robert Coleman a greengrocer (see above). On 14th September 1853 Henry and Emma baptised a daughter Paulina Carter at St Mary’s Church in Thornbury. Henry was described as shoemaker. On 7th October 1855 when their next child Joseph Morgan Carter was baptised Henry was described as gardener. Some time between 1855 and 1858 the family left Thornbury. However the rate book of 1859 shows that Henry Carter continued to own this property which was occupied by George Maishment. By the census of 1861 the family lived at Clanna in Alvington near Lydney in Gloucestershire. Henry was aged 33 and a gardener. Emma was aged 29. The couple had four children at this stage; Paulina aged eight, Joseph aged five, William aged three and Edwin aged two months. We understand that William Robert Carter was baptised in Alvington on 18th February 1858 and Edwin Henry Carter on 7th February 1861 in Lower Clanna Alvington. Mary Ann Carter was born about June 1863. Emma appears to have died in childbirth at Clanna on 31st January 1866. She was buried in Thornbury on 4th February 1866 aged 35 years. The “abode” noted on the burial record was Lydney. Emma’s daughter, Louisa Imanda died on 9th April 1866 aged two months. Her death as registered in Gloucester. Henry married again in the June quarter of 1871. However we are unable to be sure of the name of his wife. The FreeBMD website indicates that it could be either Keziah Townsend or Jane Bullock. However neither of these seems to be the lady who he appears to have married according to the census of 1881. In that census Henry Carter was a gardener in Gloucester aged 52 born in Thornbury. His wife who was said to be called Jemima (and so neither Keziah not Jane) was 35 years old. We have no explanation for these discrepancies and would be very grateful to hear from anyone who knows the full story. According to this census she was born in Thornbury. However subsequent censuses say that she was born in Frocester. They had two daughters; Mary aged 18 a general servant and Rosina aged 13 who was still at school. It appears that Henry never returned to Thornbury. The 1891 census shows that he was aged 62 and a gardener. Jemima was aged 47 from Frocester with their son Henry Charles Carter aged seven and born in Gloucester. Henry Fletcher Carter died in Gloucester in 1898 aged 69. We know that he continued to own Wellbourne until at least 1894 renting the property out to tenants after he left Thornbury in the 1850s. We assume that the house was sold following his death. The 1911 census shows that Jemima then aged 65 and widowed was living in Gloucester with her son Henry aged 28 and daughter in law Louisa aged 30 and their two children Grace and Arthur. Jemima died in Gloucester in 1927 aged 80 years. William Cullimore bought this property at some time between 1894 and 1900. From 1907 his son Austin Cullimore lived in this property. Click here to read about Austin. William died in September 1913 aged 71 years. It seems likely that the property was inherited by his son Austin. In 1917 Austin Cullimore’s family moved away from Thornbury. We have a sale notice dated July 1917 listing the considerable number of properties owned by the estate of William Cullimore. However the cottage now known as Wellbourne Cottage was not included in this list. Click here to read about William Cullimore. George Herbert Hall. By 1925 and possibly from 1917 George Hall owned this property. He let it to tenants until about 1931 when one of his sons Thurburn Slade Hall lived in this house. George was a plumber. He and his wife Frances lived at 22 Castle Street, where they remained for many years. George died there in 1946. Read more about George Hall. Thurburn Slade Hall was born 24th April 1896. He was the son of the previous owner of Wellbourne George Hall and his wife Frances. He was enrolled at St Mary’s School in Thornbury in April 1902. He left there in 1911 and on 17th January 1911 he was enrolled in Thornbury Grammar School. He left in 1913 to be apprenticed to his father. In 1916 Thurburn applied for exemption form military service on the grounds that his father needed him in the business. He was granted conditional exemption, but this was withdrawn in February 1917. In 1917 on March 24th the Gazette announced that the Thornbury Troop of Boy Scouts had lost their assistant scoutmaster because Thurburn Hall had joined the army. Apparently he had joined the scout troop on April 24th 1910. He married Ida Marion Frances Shepherd in 1931. Ida was born in Thornbury on 30th April 1901 and was the daughter of William James Shepherd and Jane nee Roberts. 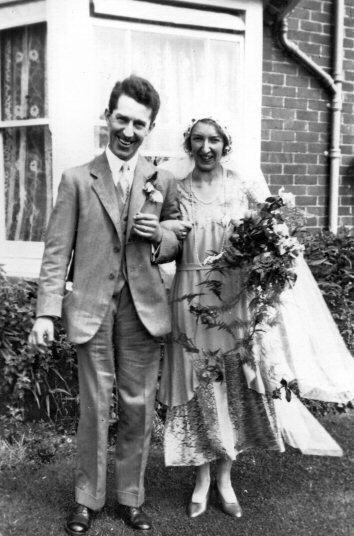 It seems that Ida was living at the home of her parents at Redston in Church Road, Thornbury when she married. Thurburn and Ida lived at what is now Wellbourne Cottage at 54 Castle Street. It seems likely that Thurburn acquired this house from his father George Hall on his marriage. The photograph on the right shows them on their wedding day. See also our album of photographs of the Hall family. We have been told that before the Health Centre was built in Thornbury Ida Hall used to sell cod liver oil and orange juice to new and expectant mothers in the shop at 22 Castle Street owed by the Hall family. Thurburn Hall died 1968. Ida Hall continued to live at Wellbourne Cottage. She officiated at our marriage in 1979 and in her capacity as Registrar she signed our marriage certificate. Ida died in 1986 aged 85.